Façades are installed on buildings to enhance visual appeal. But facades can do more than just look good or serve as a visual marker. Locker Group believes it’s important for architects to find a balance between form and function when designing the facade of a building. Getting this balance involves looking beyond mere aesthetics to give the facade a more functional purpose. Many buildings today are retrofitting facades to achieve dramatic savings in energy expenditure, but there's so much more they can do. This article looks at two innovative facade designs that have fully embraced multi-functionality. Al Bahar Towers, designed by Aedas Architects, featured glass exteriors that increased the heat within the building in the sweltering climate of Abu Dhabi. Sunscreens that change in response to heat were seen as the solution and fitted to the windows. The exterior modules, inspired by the traditional wooden lattice screening called ‘mashrabiya’ in Arabic, are controlled by computers that react to the sun and change the configuration of the screens, protecting the building’s residents from the harsh temperatures through more effective shading. The sunscreens on the building open and close, aligned with the movement of the sun around the building throughout the day, keeping the occupants cool and comfortable. Locker Group's Atmosphere façade also reduces the amount of solar radiation hitting a building's windows while retaining air flow and maintaining the views. Hospitals are known to restore health to their patients but there’s a hospital in Mexico City that also improves the health of the residents in the neighbourhood. The unique façadeon the hospital building scrubs pollutants from the surrounding air. 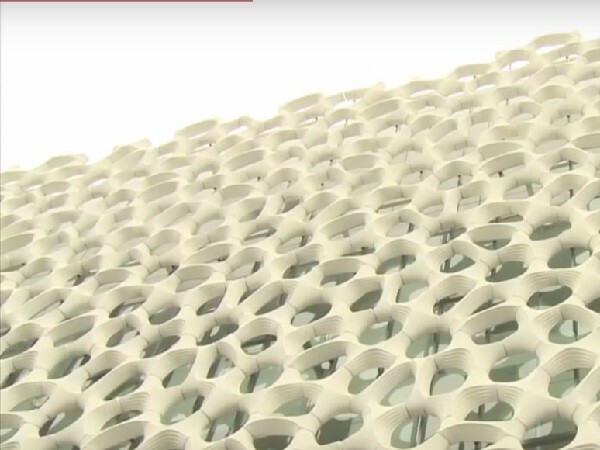 Coated in a titanium dioxide layer, the facade, when exposed to UV radiation, converts common car exhaust pollutants (such as nitrous oxides, volatile organic compounds and sulphur dioxide), into harmless products, according to German architectural firm Elegant Embellishments. So how effective is this solution? This single façade has the ability to remove pollution released by 1,000 cars per day. The unique shape of the façade slows down the flow of air around the building, to further heighten its efficiency at removing toxins from the immediate atmosphere. While these façade systems employ cutting edge technology to improve functionality, there are simpler ways to help you achieve your façade design objectives. To find out how Locker Group's range of architectural products can help improve the energy efficiency of your building, get in touch with the team today.